"The choice to explore outer reaches where ancestors didn’t dare to tread." In the Yukon, Carcross/Tagish First Nation youth are building world class singletrack trails and ski touring, redefining their people's mountain culture and leading their elders toward a new future. Legend has it that Tsélgi Shaa, or Montana Mountain, is one of four peaks in the Carcross area that Game Mother used to string up a hammock and gather her animal creations before she released them to live across the land. “Carcross” itself is the truncated version of “Caribou Crossing”, the original name for this funnel point in the migration route of a herd once so plentiful that its downslope movement in the fall created the surreal impression of mountains crumbling. The preamble and aftermath of the Gold Rush, and manic rush of the Alaska Highway some 45 years later, changed all of this. Endless streams of people and riches flowed through these valleys, first in a stampede that posed a brief and annoying interruption to daily life, and then as a lingering houseguest who brought with them a highway, guns and trucks full of booze. Decades of boom-bust industry have left their mark on Montana Mountain. The daring feats of catskinners are etched across the mountainside, permanent reminders of industry’s dogged pursuit of silver and gold. Far below in Carcross, the scars are more subtle, but equally persistent—the decaying foundation of the former residential school, empty liquor bottles discarded under groves of spruce trees, caught along the stunning, windswept expanse of beach and dunes extending beyond the schoolyard fence. In 2006, Carcross/Tagish First Nation (C/TFN) undertook a small initiative with a big dream. The Singletrack to Success (S2S) Project’s vision was to “build a destination, one trail at a time,” and to employ its youth in doing so. It was the year before C/TFN signed its land claim agreement with the Yukon and Canadian governments, marking the return of autonomy over its lands, resources, and people. The question of economic self-sufficiency loomed large on the collective conscience of C/TFN citizens. The environmental impacts of mining were deemed too great; no, this Nation needed to find another way. Tourism offered a viable option, and trails—the “paydirt” of the adventure-fueled travelling set—were a tangible starting point. Niko Helm and Shane Wally began their working lives with S2S, building and restoring trails on their ancestral mountain. My wife Jane and I moved to Carcross in 2006 to shepherd the project along and have remained closely involved ever since. Niko, Shane and I spent months together on that mountain, toiling, problem-solving, laughing, and learning. The last weeks we shared were in the waning summer of 2010, when we constructed a 900-foot boardwalk mid-mountain, the final piece in the restoration of a 105-year old wagon road. In retrospect, that boardwalk could be viewed as a symbolic point of divergence for the two young men; in the years that followed, Niko headed for the alpine to explore the boundaries of rock and ice, while Shane returned to the village below to mentor the next generation of youth. But a closer look reveals a convergence of their efforts: both are at the forefront of redefining the mountain culture of their people. Youth are striving to maintain their nation’s connection to the land and animals through building and riding trails. The discovery of gold in the Klondike forever changed this land. Between 1896 and 1898, some 30,000 stampeders forged their way from tidewater over the Chilkoot trail into the Yukon interior. The Chilkoot traverses a weakness in the Coast Range, terminating some 50 kilometres south of Carcross, and was for centuries the exclusive trading domain of the interior Tagish people and their coastal cousins, the Tlingit. Where the Tagish and Tlingit approached the trail with expedition-like efficiency, the stampeders arrived hapless and ill prepared. In an effort to stave off their inevitable famine, the Canadian government mandated that one tonne of supplies had to accompany each stampeder into the Yukon. Almost overnight, virtually every able-bodied Carcross/Tagish person, women and children included, was employed in the packing trade. The average load for a male packer was 57–73 kilograms, and the journey—some 42 kilometres over 1100 metres of elevation gain—completed in 12 to 14 hours. A Chilkoot packer could net a daily wage of up to $1500 in current dollars—not bad for a first foray into wage labour. Racism and romantic preoccupation with more glamorous Gold Rush characters cast a shadow on the remarkable mountain sense and abilities of the Chilkoot packers. Keish—a packer for the European explorers of the 1880s and later the discoverer of Klondike gold—earned the nickname “Skookum Jim” by hauling a legendary load of bacon over the Chilkoot Pass. Niko’s ancestors Billy and Dan Johnson forged their own legends on the trail. But none of these larger-than-life characters ever rose to the prominence of Tenzing Norgay roped up to Edmund Hillary. Only in the past few decades has written history begun to account for the significant role the Carcross/Tagish played in one the grandest and most treacherous mass migrations the planet has ever witnessed. The oral history never forgot though, as the stories passed down from generation to generation in Carcross can attest. 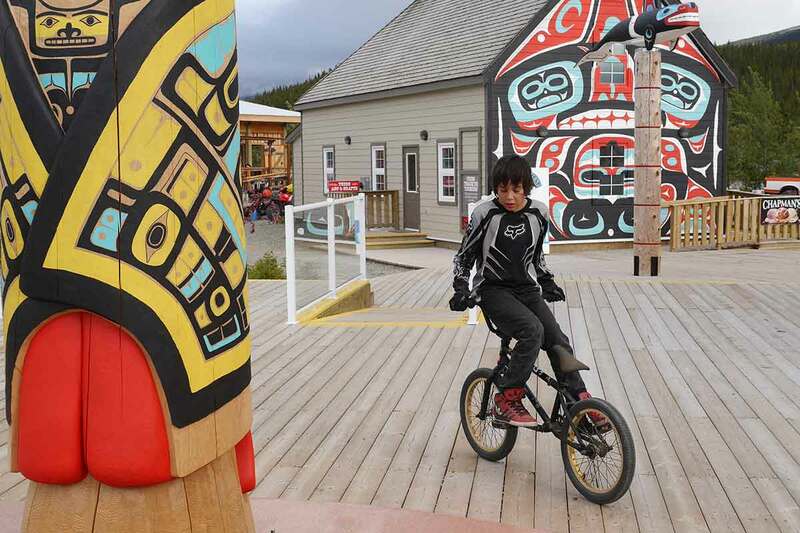 Throughout the post-Gold Rush chaos and 20th government policy intended to abolish First Nation cultural practices and language, the Carcross/Tagish people have never faltered in their deep connection to the land. Niko’s family trapline boasts a unique pedigree, being the only one situated along the Chilkoot Trail, which is now protected and managed via a joint US/Canada historical park that has employed Niko for the past three summers. It was a brisk day early this October when Niko and I set out to ski a remnant of an ancient glacier high on Montana Mountain. When Niko first started building trails at age 17, he had just quit high school. There were times when his family worried for his future, and wondered whether he would make the right choices. Today, Niko’s home bears testament to those choices: several pairs of fat skis leaning in a corner of his tidy living room, his Parks Canada uniform hanging in the closet, his calendar too full with future plans to dwell for long on that hard-fought high school graduation. Niko wants to become a professional ski guide. It’s a bold and somewhat unprecedented dream for a kid from Carcross. To that end, for the last few winters Niko has been tail gunning for Yukon Alpine Heliski, a unique operation that has expanded on the local tradition of camping at the high mountain passes separating the Yukon interior from the Alaskan ports of Haines and Skagway. Owner/operator Peter Wright uses a contract helicopter, RVs, and mobile sauna to chase fresh snow across the region—a quirky setup reminiscent of early days in Valdez. In the spring, Niko and Pete scouted a bold new 90 kilometer route, traveling jumbled, heavily glaciated terrain. Months later, Niko is still buzzing from the experience. Before leaving, we stopped to visit Niko’s mom, Donna Geddes. In the populated southern Yukon, carrying out a traditional lifestyle requires every technological advantage. A quick survey of the property revealed the full gamut of state-of-the-art boats, ATVs, and snow machines—the tools that Donna and her husband, master carver Keith Wolfe Smarch, use as needed to live both on and off the land. Tired after 27 days at a remote alpine camp, her annual moose hunt was successful. The massive carcass—enough to feed four families for most of the upcoming winter—was hanging in the shed. She traced out the final butchering cuts for me. “My kids grew up not knowing about gristle.” Even so, moose are scarce—as hard to come by as a powder day in the fall. In a boardroom in Carcross early this past summer, a respected Elder describes the seasonal movements of caribou on Montana Mountain to decision makers in the Carcross/Tagish First Nation government. A young voice is up next, respectfully correcting certain details and expanding upon others, confident and knowledgeable in the topic at hand. Those gathered listen with a mixture of pride and surprise. The voice belongs to 25 year-old Shane Wally, who has amassed a decade of firsthand knowledge about the mountain owing to his membership on—and for the past four years, leadership of—the S2S trail crew. 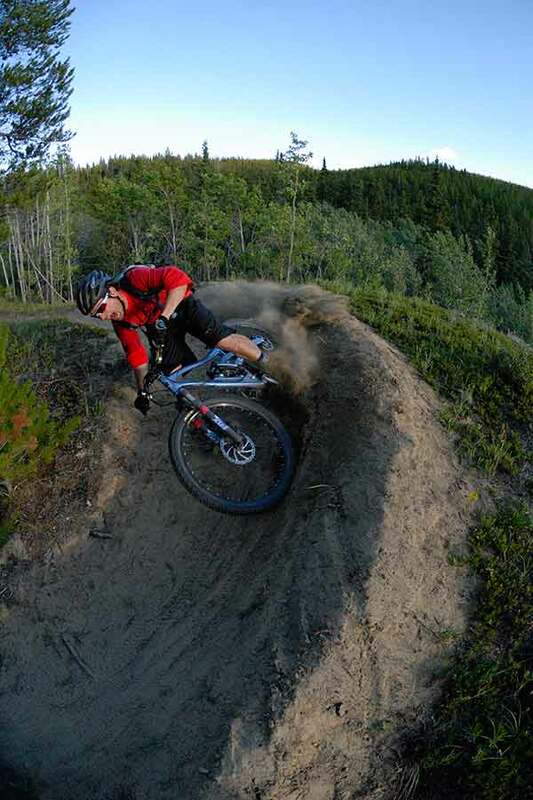 In 2006, Shane was the only kid in town with a decent mountain bike. Skinny, shy and helmet-less, he would spend hours building plywood ramps to launch his bike. It was his first job, and there was much to learn. Each morning he would dash to the local gas station to acquire the day’s provisions: packaged hamburgers, a bag of chips, and a few cans of energy drink. A heavy camouflage jacket barely kept the rain out on the miserable days. It took time for his humour, creativity and bush smarts to emerge. One particular day, mindful of his Elders’ teachings, he led the crew around the remains of a bull caribou as a show of respect. Later that summer, after I chose a terrible “shortcut” that resulted in wet feet for the entire crew, Shane quipped: “Never follow a white guy through the bush.” His insecurities, eroded by time on the land, gave way to its day-to-day rhythm. Still, the patterns of small town life were hard to break. Sometimes Shane was late for work, other times he failed to show up at all. During his fourth season on the crew, he passed out in a snowbank on his way home after a party, an all-too-common story in a part of the world where suicide and self-inflicted injuries are the leading cause of death for aboriginal youth. Slowly freezing to death, Shane awoke just in time, alive. The following summer, “the Wallyman” emerged. Towering at 6’3″, he broke axe handles and shovels with his seemingly boundless strength. Crafting hand-built singletrack became his passion and motivating a new generation of youth, all of whom watched in awe, his calling. He was a young man discovering his inner and outer strength. High up on the slopes of Montana, permanent snow squeaks winter underfoot. Strapped to Niko’s pack, his tried-and-true technological advantages: frame bindings, four buckle boots that are a bit too tight and his skis, plastered with stickers from the latest industry flicks. Tired and sweaty, but happy to be where we are (after some dubious route-finding by yours truly), we bust open a package of salted moose nose from Donna. On an outing a week or so earlier, we had visited the skeletal remains of Niko’s ancestral cabin on the shore of windswept Bennett Lake. Inside was a note etched in pencil on a piece of wood, “April 1933. Going to Teslin tomorrow. Goodbye to you,” written by his great-grandfather. Few people held out any real hope of the S2S project living up to its potential. The obstacles were simply too great: a run-down, ramshackle town rife with social problems, disaffected youth, skeptical Elders. The project exposed a generational divide between those who reminisce about the old ways and those who seek to redefine those ways through recreation. Some Elders still struggle to understand the notion that the youth are striving to maintain their nation’s connection to the land and animals through building and riding trails, and that to them, the spirituality of this sacred place is upheld by sharing it with others. Four of the new recruits on Shane Wally’s crew this past season were too young to remember Carcross before these trails. Accolades and media have poured in from unexpected places—Japan, France, the UK, with publications like Outside and video crews coming to capture the 65-odd kilometres of this emerging destination. Real estate is being sniffed out by young families and active retirees. Past, present, and future all converge in these storied and sacred mountains. Past, present, and future all converge in these storied and sacred mountains. On the face of it, the Chilkoot packers bear little resemblance to Niko and his fat skis, or Shane and his trail crew swinging pulaskis to the beats emanating from a Bluetooth speaker. The life-or-death imperative of traversing these peaks and valleys has been replaced by sheer enjoyment and choice: the choice to harvest animals versus visiting the grocery store; the choice to explore outer reaches where ancestors didn’t dare to tread; the choice to air that gap jump instead of planting feet firmly on the ground. But a century and its technology are dwarfed, trivialized even, by the time immemorial existence of the Carcross/Tagish in this place. Change has been the constant, its presence signaling a millennia-old cycle merely beginning anew. Chilkoot packer or backcountry skier, these are Canada’s original mountain people, and they’ll continue to adapt and thrive in both peak and valley, on their own terms, in their own time.